This article is about the section of Interstate 95 in Maine. For the entire route, see Interstate 95. Interstate 95 (I-95) in the US state of Maine is a 303-mile-long (488 km) highway running from the New Hampshire state line near Kittery, to the Canadian border near Houlton. It is the only two-digit Interstate Highway in Maine. In 2004, the highway's route between Portland and Gardiner was changed so that it encompasses the entire Maine Turnpike (including the former I-495 between Falmouth and Gardiner), which runs from Kittery to Augusta. I-95 enters Maine from New Hampshire on the Piscataqua River Bridge, which connects Portsmouth, New Hampshire with Kittery. At mile 2 (Spruce Creek) in Kittery, the highway becomes the Maine Turnpike. The highway runs in a general northeasterly direction, parallel with U.S. Route 1 (US 1), at this point. I-95 bypasses the Biddeford/Saco area, with a spur route, I-195, connecting to Old Orchard Beach. At Scarborough, I-95 meets the southern terminus of I-295. The highway turns north, serving the Portland International Jetport and bypassing Portland to the west. At Falmouth, the highway meets unsigned I-495, also called the Falmouth Spur. Until January 2004, I-95 followed the Falmouth Spur and I-295 between Falmouth and Gardiner. The highway continues north along the Maine Turnpike (which was I-495 prior to 2004) through Gray to Auburn and Lewiston, which the turnpike bypasses to the south. The highway then runs in an easterly direction to meet the northern terminus of I-295 at Gardiner. From there, I-95 parallels the Kennebec River past Augusta and Waterville. The highway then crosses the river at Fairfield and then turns northeast along the Sebasticook River past Pittsfield to Newport. I-95 then continues east alongside US 2 from Newport to Bangor, where I-395 connects to the city of Brewer. The highway runs along the northern edge of Bangor's center, then turns northeast, following the Penobscot River past Orono and Old Town (Prior to the early 1980s, I-95 was a super two highway north of Old Town). The highway continues north, still running near the river, towards Howland. Near Lincoln, I-95 runs north through uninhabited forest land, crossing the Penobscot River at Medway. The highway goes northeast and east, passing a series of small Aroostook County farming towns before reaching Houlton, where it connects to New Brunswick Route 95 and US 2 at the international border. North of Bangor, traffic levels drop noticeably, with AADT averaging only about 5,000 in northern Penobscot County and going down to as low as 2,000–4,000 in Houlton. The Maine Turnpike Authority was created by the Maine Legislature in 1941 to build and operate a toll highway connecting Kittery and Fort Kent. In 1947, the first section of highway, designated the Maine Turnpike, opened between Kittery and Portland. In 1953, the Turnpike Authority began construction on an extension to the state capital at Augusta using the former right-of-way of the Portland–Lewiston Interurban railway from Portland through Falmouth. The original turnpike was the largest construction project in the state's history until the construction of the extension, which opened to the public on December 13, 1955. The Maine Turnpike was the first highway funded using revenue bonds. It remains self-financed and does not receive funding from the state or federal government. When the first section opened in 1947, it was only the second long-distance superhighway in the United States following the October 1940 opening of the Pennsylvania Turnpike. For these reasons, the Maine Turnpike was named a National Historic Civil Engineering Landmark by the American Society of Civil Engineers in 1999. In 1956, one year after the Portland-Augusta extension opened, Congress created the Interstate Highway System. The remaining sections to be built—from Augusta to Fort Kent—would be publicly funded freeways instead of toll roads under the Maine Turnpike Authority. Today this highway, which ends at Houlton instead of Fort Kent, is signed as Interstate 95 throughout and the Maine Turnpike between the New Hampshire line at Kittery and the junction with US 202 near Augusta. The Maine Turnpike had a posted speed limit of 70 mph (113 km/h) in the early 1970s, but as Maine then had no law against traveling less than 10 mph (16 km/h) over the posted limit, the de facto speed limit was 79 mph (127 km/h). In 1974, as part of a federal mandate, the speed limit was reduced to 55 mph (89 km/h), with a new law including a "less than 10 over" violation. In 1987, Congress allowed states to post 65 mph (105 km/h) on rural interstate highways. Following the relaxation, Maine increased its speed limit. In May 2011, a bill was introduced to raise the speed limit on I-95 from Old Town to Houlton from 65 mph (105 km/h) to 75 mph (121 km/h). It passed, with Maine the first state east of the Mississippi River since the 1970s to establish a 75 mph (121 km/h) speed limit. A further law passed in 2013 by the Maine Legislature allowed the Maine Department of Transportation and the Turnpike Authority to change speed limits with the approval of the Maine State Police. Per that law, Maine DOT increased the 65 mph (105 km/h) limit to 70 mph (113 km/h) on several sections of Interstate 95 on May 27, 2014. These areas included the section from mile marker 114 just outside Augusta to mile 126 just before Waterville. In addition, the section from Fairfield (just north of Waterville) to Bangor also saw an increase to 70 mph (113 km/h). Speed limits on sections controlled by the Turnpike Authority increased on August 11, 2014. The sections from mile marker 2.1 in Kittery to mile marker 44.1 in Scarborough and the section from mile marker 52.3 in Falmouth to mile marker 109 in Augusta increased from 65 mph (105 km/h) to 70 mph (113 km/h). The section from mile marker 44.1 in Scarborough to mile marker 52.3 in Falmouth increased from 55 mph (89 km/h) to 60 mph (97 km/h). The Maine Turnpike is a toll road for all of its length except south of York and between Auburn and Sabattus. Flat-fee tolls are paid upon entering the turnpike and at toll barriers in York, New Gloucester, and West Gardiner. As of 2012, it costs passenger vehicles $7 with cash and $6.45 with E-ZPass to travel the entire length of the turnpike. The turnpike joined the E-ZPass electronic toll collection network in 2005, replacing the former Maine-only system designated Transpass that was implemented in 1997. The tolls on the Maine Turnpike were not supposed to be permanent. Toll collections were to stop once the Maine Turnpike Authority paid off the debt from the road's construction. In the 1980s the bonds were going to be paid off but the Maine Legislature authorized the Maine Turnpike Authority in 1982 to continue as a quasi-governmental agency and to continue to collect tolls in order to fund the maintenance of the section of highway controlled by the MTA. Kennebunk—a separate plaza is located on each direction of the turnpike at milepost 25. The plazas have near-identical layouts and each includes Burger King, Starbucks, Citgo gas stations, and Z-Market gift shops among the offerings. The original plazas opened in 1947, and incorporated a pedestrian tunnel under the highway to connect the two. These original plazas were replaced in 1972, and the tunnel was sealed. The 1972 plazas were then replaced during the winter of 2006–2007, reopening in 2007. Gray (northbound) and Cumberland (southbound)—a separate plaza is located on each direction of the turnpike on either side of the Gray–Cumberland town line at milepost 59. Each includes Burger King (both sit-down and drive-thru) and a Citgo gas station. Both plazas were rebuilt in 2007, and are currently the only two plazas to feature a drive-thru food option. West Gardiner—accessible from both directions of both the turnpike (I-95) and I-295, which converge together just north of the plaza. The plaza itself is located just off the highways, along SR 9 and SR 126. Similar in size and layout to the Kennebunk plazas, Burger King, Starbucks, and Citgo gas are among the offerings. This plaza also includes the Center for Maine Craft, a gift shop featuring locally made products and visitor information. The West Gardiner plaza was built and opened for business in 2008. The plaza replaced two smaller service plazas that were located in Lewiston (southbound at milepost 83) and Litchfield (northbound at milepost 98), both of which were closed and demolished. There is a rest area and tourist welcome center located on the turnpike northbound at milepost 3 in Kittery. There are weigh stations located on the turnpike northbound and southbound in York at milepost 4 (southbound) and milepost 6 (northbound). There are ramps to and from the northbound turnpike to the Saco Ramada Hotel and Conference Center in Saco at milepost 35. The ramps are from the original exit 5 which was replaced when I-195 was opened just to the north. The hotel was built on the site of the old toll plaza. Ramps connecting the hotel to and from the southbound turnpike were removed as part of the widening project in the early 2000s when hotel ownership opted not to pay nearly $1 million to build a new bridge. North of Augusta, there are two additional pairs of rest areas before I-95's northern terminus in Houlton. Separate facilities are located on each direction of I-95 in Hampden, just south of Bangor; and in Medway, about halfway between Bangor and Houlton. There are 24-hour restrooms at all four locations, while the Hampden facilities each feature a state-operated Maine information center available during daytime hours. A final rest area, which also contains a state-operated Maine information center, is located in Houlton, and is accessible from both directions of I-95 by taking exit 302. ^ "Welcome to the Maine Turnpike Authority". Maine Turnpike Authority. Retrieved September 19, 2011. ^ "Maine State Route Log". Archived from the original on February 28, 2008 – via floodgap.com. ^ Cummings, Osmond Richard. "Portland-Lewiston Interurban: a history of the finest electric interurban railway to run in the State of Maine". Bangor Public Library. Retrieved September 5, 2014. ^ "History". Maine Turnpike Authority. ^ "Maine Turnpike". Archived from the original on June 2, 2013. ^ Miller, Kevin (May 12, 2011). "Bill would boost speed limit to 75 mph on northern highway". Bangor Daily News. Archived from the original on July 15, 2012. Retrieved May 22, 2011. ^ "Lawmakers OK 75-mph speed limit between Old Town, Houlton, Bangor Daily News, June 29, 2011". The Bangor Daily News. Retrieved October 4, 2014. ^ Koenig, Paul (May 27, 2014). "Speed limit increasing by 5 mph on parts of I-295, I-95". Kennebec Journal. Retrieved May 27, 2014. ^ "Turnpike News: Travel Advisories". Turnpike Traveler Services (Press release). Maine Turnpike Authority. Archived from the original on October 2, 2014. Retrieved October 4, 2014. ^ "Tolls". Maine Turnpike Authority. Retrieved January 16, 2019. ^ "E-ZPass Information Frequently Asked Questions". ^ "Keep the change: Toll highways aren't going away". ^ "Ramada Saco / Old Orchard Beach Area (official site)". Retrieved October 4, 2014. ^ a b Maine Department of Transportation. MaineDOT Public Map Viewer (Map). Maine Department of Transportation. Retrieved April 7, 2017. 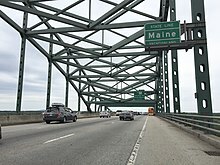 Wikimedia Commons has media related to Interstate 95 in Maine.